Prosciutto. Capicola. Pancetta. Lonzino. Bresaola. I’ve always enjoyed this kind of charcuterie, when it’s done well. In recent years, though, the quality of products in the shops has really declined. It used to be I could find decent prosciutto at our regular grocery, but now I have to go to high-end shops or specialty purveyors to find anything approaching decent quality. Prices, naturally, have skyrocketed as well. I’ve always wanted to try my hand at charcuterie, but I didn’t have a cave to hang the meat for a year while it aged. Then, a couple of months ago, I heard about a product that allowed me to make charcuterie at home, in my fridge. Reviews were good, so I gave it a try. UMAi Dry is a system that allows you to age meats–cured and uncured–at home in your refrigerator. You can dry-age uncured steaks and roasts, as well as cured meats and sausages. The difference is in the “dry age bags” UMAi provides. These bags are used much like you use any vacuum-sealed food-saver bags, but these dry-age bags are more gas-permeable, and allow moisture to leave the meat as it ages. I purchased the UMAi Charcuterie kit ($22.50) which comes with 2 large and 3 small dry age bags, plus some additional items such as InstaCure #2 and juniper berries. To use the UMAi bags, I also had to purchase a vacuum sealer: I picked up Foodsaver 2461 which had the best mix of features (moist and dry settings) and affordability (around $72). Then I went down to CostCo and came home with several large hunks of meat. I decided to try my hand at capicola (pork shoulder), bresaola (beef rib-eye roast), lonzino (pork loin), and lomo (pork loin, aged in paprika). I started them all at the same time, cured the all for 2 weeks, transferred each to a dry-age bag, and popped them back in the fridge. They remained on a rack in the fridge until they lost between 35-40% of their weight, which took about 5 weeks. For the big “reveal,” I sliced (by hand) a couple ounces of each meat, and brought them to a dinner with fellow foodies. It was a tough room, but I knew I’d get a fair judgment. Opinions were universally positive. The quality of the result was miles ahead of anything pre-packaged available in the shops, and in the case of the bresaola and capicola, rivaled what the high-end grocers/deli counters could offer. I need a decent slicer. My hand-slicing, though thin, was not thin enough. You really need a paper-thin slice to get the best flavor from each cut. A few days later, I tried slicing the meat using my cheap ($34) slicer, and it did better than hand-slicing, but it still ruined about 40% of the slices I made. I have a new slicer on order. I need to wrap/tie the cuts before I set them to age. Without binding them, the pork cuts really flattened down which gives both a less than appealing shape and a drier center than I wanted. By tying each cut up, the loins the shoulder can retain a more cylindrical shape instead of the thin, squarish cuts I got. 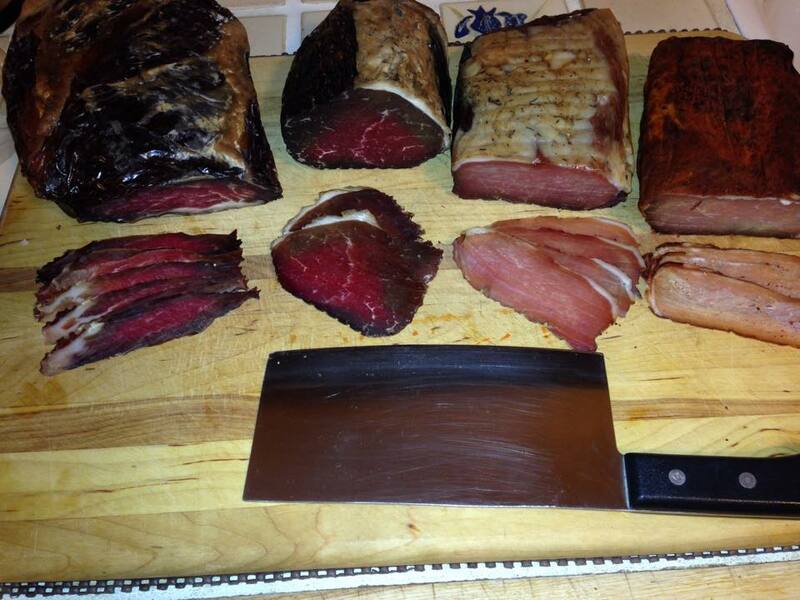 Here’s a picture of the results: (l-r) capicola, bresaola, lonzino, and lomo. I’ll be setting up another group, and I’ll be expanding to try the UMAi Salumi kit, as well. An excellent product. Highly recommended. Your willing guinea pigs eagerly await the next batch. I especially liked the lonzino, though they were all excellent. Watching the instructional videos on the UMAi site, tying/binding the cuts for the aging process _greatly_ affects the quality of the outcome. Also, this coppa/capicola will be “hot,” with a pack of chipotle and paprika to take it through the dry age phase. Yum! Wait ’till you tell your SO that you’re quitting your day job to focus full time on charcuterie!